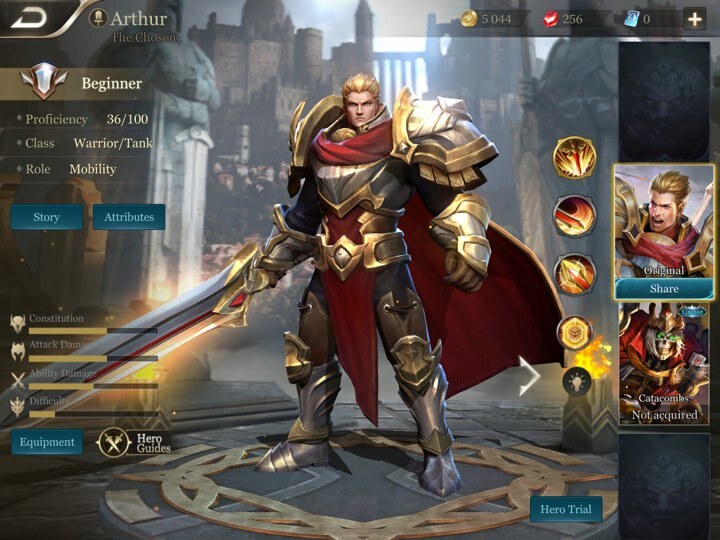 An introduction to Arena of Valor and prelude to our Beginner's Guide. 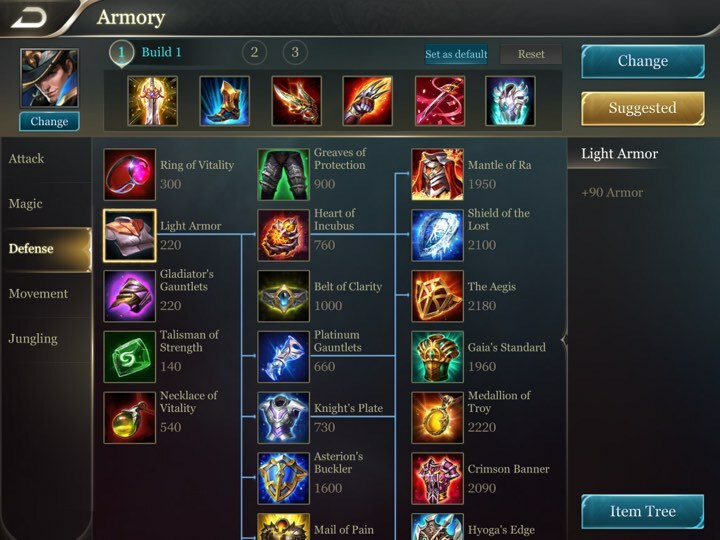 Learn the basics and get a general overview of AoV. This is an introduction to Arena of Valor. For a more in-depth look at Arena of Valor in the context of other MOBAs, click here. Arena of Valor (AoV) is a mobile Multiplayer Online Battle Arena (MOBA) game, one of the most popular game types in the world. 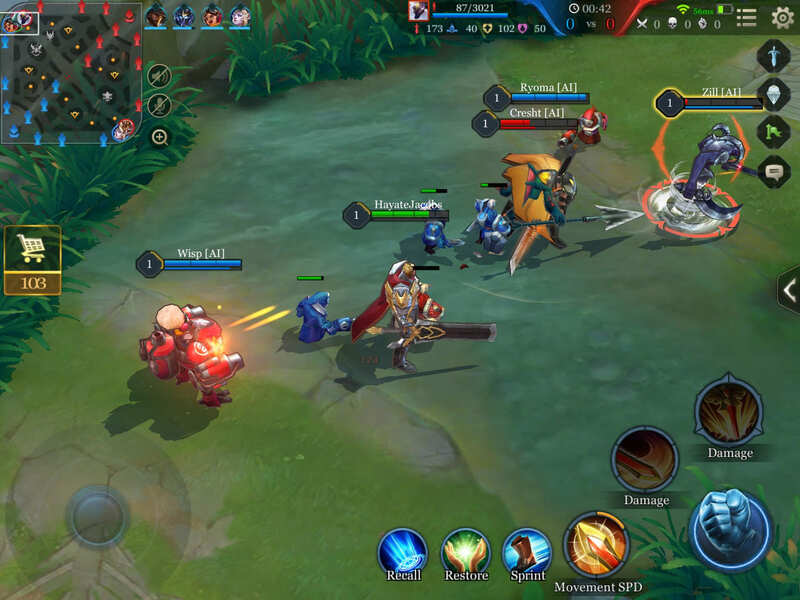 Like in other popular MOBAs, the goal is to destroy your opponent’s main structure, called the Core in Arena of Valor. Standing in the way of the core are nine towers – three per lane – that players must destroy to advance into the opponent’s side of the map. Teams are usually composed of five players, though other modes with fewer players are playable. A standard team composition consists of at least one character that can absorb/block damage, one character that can deal damage, and one character that can heal allies (or at least prevent them from taking damage). Minions regularly appear and march toward the enemy in each lane. Players gain experience and gold by standing near them when they die and can earn more gold by delivering the killing blow, or “last-hitting.” In addition, minions are often needed to absorb tower damage if you want to take out an opposing tower, so eliminating opposing minions is an important part of the game. There are 64 heroes in the game (varying depending on the region you’re in), split into six different categories: Assassin, Mage, Marksman, Support, Tank, and Warrior. 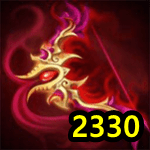 Assassins, Mages, and Marksmen are all heavy damage dealers, but they deliver the damage in different ways. Support characters aid their allies by preventing or healing damage taken by enemies. Tanks and Warriors have a large pool of health, and thus absorb damage while disrupting opponents by stunning and displacing them. Click here for a list of the heroes in the game. Items are important for boosting characters’ attributes like attack speed or maximum hit points (HP). They can be purchased with gold by tapping the shopping cart below the minimap or by selecting from two preset options. There are three tiers of item strength: Tier 1 items are the cheapest, most basic items, while Tier 3 items are very expensive but offer multiple advantages to the player. 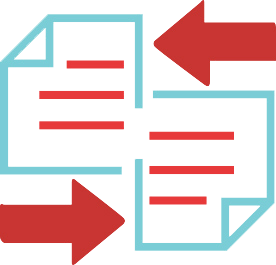 Furthermore, higher tier items require ownership of lower tier items to be available for purchase. 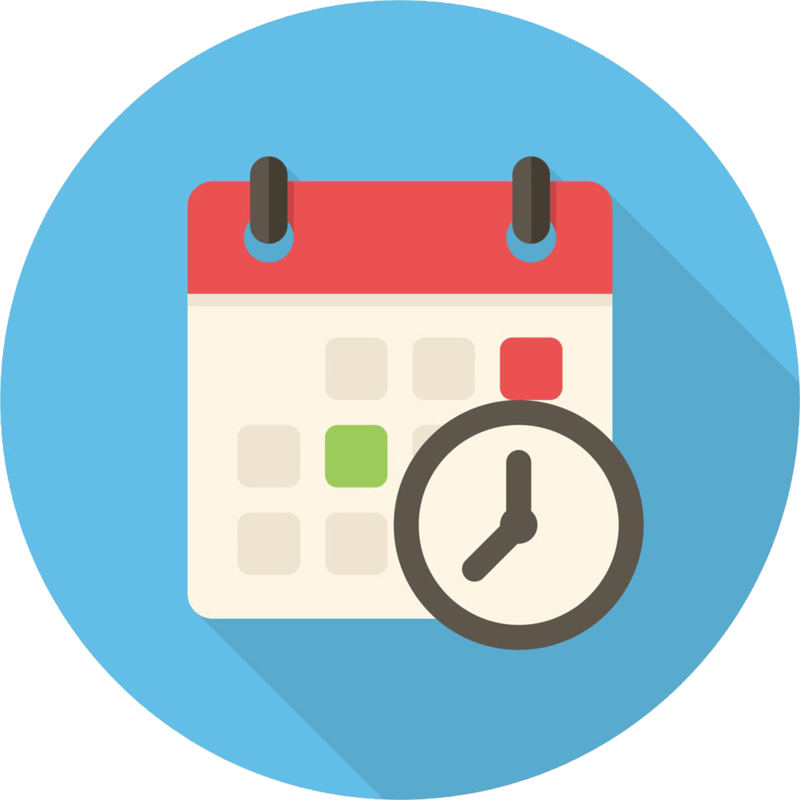 Check the Armory guide for more details. The items are additionally split into five categories: Attack, Magic, Defense, Movement, and Jungling. Choosing items that fit your character and/or the strategy you wish to employ in a particular game is crucial to achieving victory. 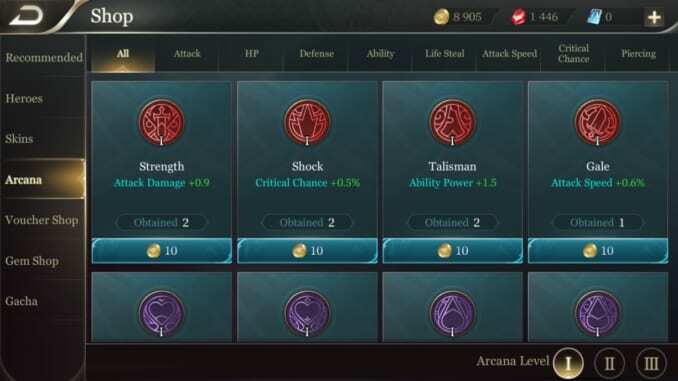 Unique to Arena of Valor are Arcana, which are special tokens available to players once they reach level seven. Affixing Arcana to slots in your Arcana page grants you additional attributes that boost your character from the start of the game. While they have limited influence in the late game, Arcana are very important for securing an early lead. Arcana are split into three different categories: red for attack, purple for life, and green for defense. They’re further divided into three levels, where level 3 Arcana grant the most additional attributes in exchange for the steepest prices. Higher-level Arcana as well as slots on your Arcana page are earned by increasing your player level. Ready to jump into the game? 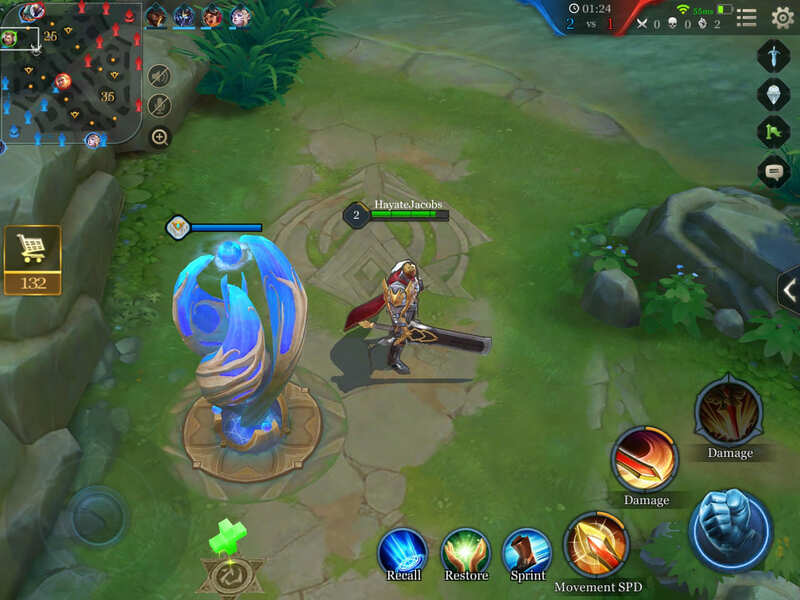 Learn how to install the game on your iPhone or Android (for users in regions where Arena of Valor is not available) or proceed to The Menu Screen.